This morning, we are featuring an historical romance with a time travel element in our book spotlight. Check out the books of The Campbell Brothers Trilogy, learn about the author & enter for a chance to win a $25 Amazon gift card in the book tour giveaway at the end of this post. He is a Scottish Laird who lives in a world of Druid magic and ancient customs, hand fasted to the sister of his rival clan, MacDougall. Alasdair thought he was doing the right thing trying to bring peace to the region. But he is murdered on the eve of his wedding. Not willing to accept his death, his mother, a Druid priestess, performs a geas to keep him alive. But something went awry because, as the last word of the geas was spoken, Alasdair is trapped in time where he wanders the earth for centuries. The only one who can bring him back home is his betrothed. He has given up on ever finding her until she walks into his office in twentieth century Manhattan. Coira Ainsley is a happy-go-lucky young woman living in twenty-first century Manhattan. Her job as a travel agent takes her all over. She loves the work she does and is excellent at it. That is until she follows her client into his office and finds herself in the fourteenth century at Inveraray Keep in the Highlands of Scotland. 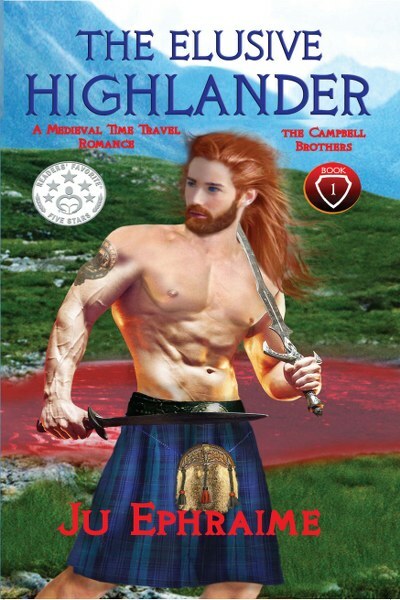 At first, Coira thinks a prank is being played on her until she sees the giant, wearing nothing but a kilt and a studded leather strap across his massive chest approach her. Not one given to swooning, Coira finds herself welcoming the darkness that come over her as she loses consciousness, without learning that the naked giant is her betrothed from another time… another place. Will she give in and accept what has been pre-destined or will she fight to get back to the life she knows and loves? 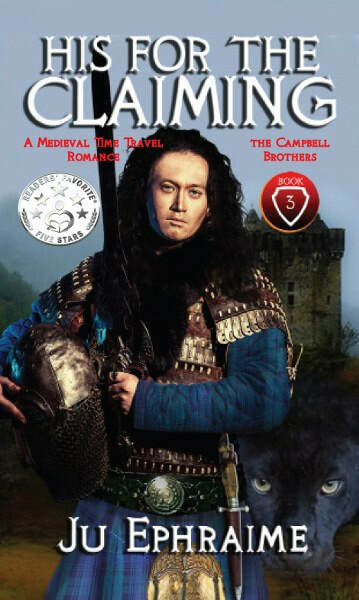 Fighting alongside his two brothers, Garvin Campbell of Clan Campbell is content to remain in the shadows. After all, he’s lived most of his adult life as a Knight Templar, and that requires him being in the shadows, not seen or heard. “Non nobis, Domine, non nobis, sed Nomini tuo da gloriam; (Not unto us, O Lord, not unto us, but unto thy Name, give glory).” That was the rule of the Templars until they were forced to disband at the request of King Philip IV "the Fair" of France. Many of the Order's members in France were arrested and tortured. However, Scotland did not get involved in the arrests and prosecution of the Knights. There was no recognized king of the Scots, and with the Bruce having already been excommunicated, the Roman church had little say in Scottish politics, so Garvin returned to his clan to use his skills in the fight against the English for Scottish independence. Having been told all her life to avoid the Campbells, the last thing Lady Helen is thinking about is falling in love with a Campbell, and a Knight Templar at that. 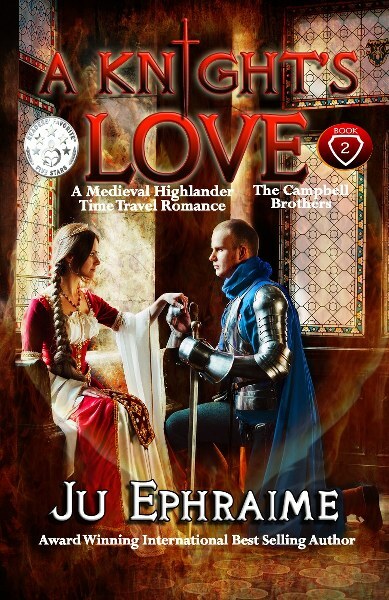 She is aware the Templar Knight has taken a vow of abstinence, so when Garvin Campbell comes to her clan to deliver the decree from Robert the Bruce, Helen is unprepared for the connection she immediately feels for the knight. She dismisses it as butterflies at meeting a knight, but fate has other plans for her and Garvin, as he becomes her reason for living and he forgoes his training of remaining in the shadows as he surrenders to love. Tristan (Tris) Campbell accepts the fact that his brother came back to them from the land of the fae. He accepts that life in the Highlands with his clan is fraught with strife and danger… that they will be forever warring with opposing clans for Scottish independence. What he doesn’t expect is that, like his brother Alasdair, he, too, will travel through time to find his one true love, Lady Brianne O’Connor. Lady Brianne O’Connor has vowed never to take a husband, and as she is her father’s only child and heir, he does not dissuade her but allows her to live as she pleases. After her new husband is murdered, or so she thinks, she takes to unexplainable weeping, spending all her days and nights in her bedchamber at Kilchurn Castle mourning him. That is the only place in which she feels safe… the only room where she can be with the love of her life. She is torn with grief by his untimely death. Tristan comes upon a woman in a vision, and now he must find a way to connect with her… a woman he is convinced he knows but, for the life of him, can’t recall from where. Bent on finding the woman who stirs his senses like no other, Tris will not rest until he can feel her in his arms again…. Will he succeed? Will Lady Brianne’s mourning finally be over? Ju Ephraime writes steamy high heat romances, packed with emotions and strong alpha characters and always a wonderful, happy ever after. She has won several awards for her writing, and had even seconded in Amazon Breakthrough Novel Contest, with her White Magic Woman. When not writing romance novels, Ju could be found writing children’s books, which includes her, Too-Clever series, a collection of ten children stories. 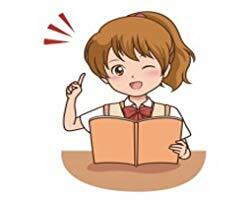 Ju writes her children's stories under, Dr. Julia E. Antoine. These days she stays busy helping in the community and donating her services to a not-for-profit organization, which she helped establish. Presently, she resides in CT where she has lived with her family for the past thirty years. She still misses her time on the sunny Caribbean islands, but takes pleasure in using them as backdrops to some of her stories. I appreciate learning about some terrific books we had not known about previously, through your blog. It sure helps find books my family would enjoy reading since they all love to read. Thanks so much!